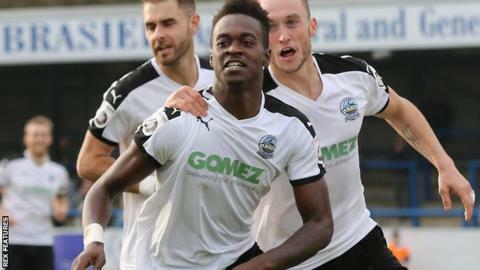 Torquay United have re-signed winger Toby Ajala from National League rivals Dover on a free transfer. The 24-year-old spent last season at Plainmoor, scoring six goals in 46 games for the Gulls. Ajala began his career at Bristol City and has also spent time at AFC Wimbledon and Welling. He has agreed a deal until the end of the season at struggling Torquay, who have won just four league matches and lie second from bottom of their league. Meanwhile, the Gulls have extended the loan of midfielder Aman Verma, 29, from Kidderminster Harriers until the end of the season.